THIS MONTH IN HISTORY JUNE 01/06/1762. Edmund Ignatius Rice. Founder of the Christian Brothers Religious Order is born. 01/06/1926. Marilyn Monroe. American actress is born. 01/06/1937. Morgan Freeman. American actor is born. 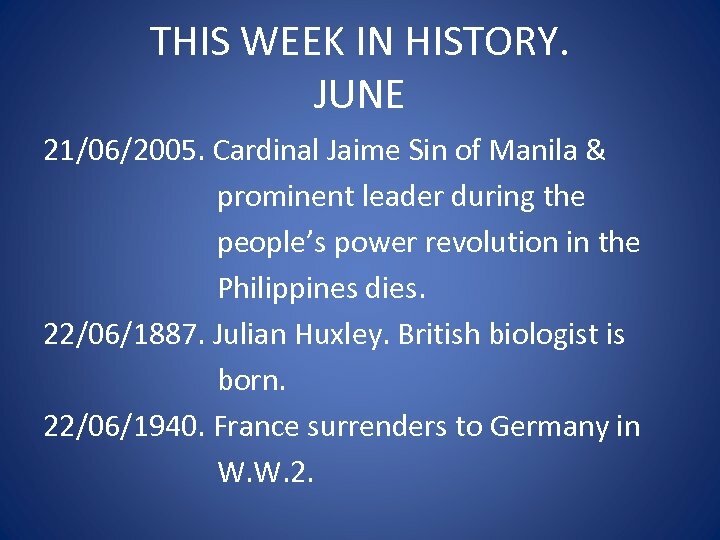 THIS MONTH IN HISTORY JUNE 01/06/1937. Colleen Mc. Culloch. Australian author is born. 01/06/1980. CNN begins broadcasting. 01/06/2008. Yves Saint Laurent. French fashion designer dies. 02/06/1840. Thomas Hardy. English novelist is born. 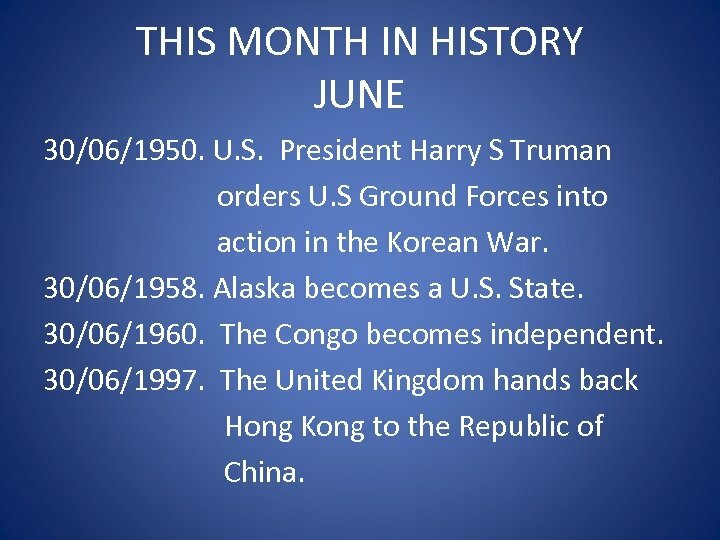 THIS MONTH IN HISTORY JUNE 02/06/1946. Italy becomes a Republic. 02/06/1953. The coronation of Queen Elizabeth 2 nd. Of England. 02/06/1965. The birthday of Steve & Mark Waugh. Great Australian cricketers. 02/06/1996. Leon Garfield. English children’s author dies. 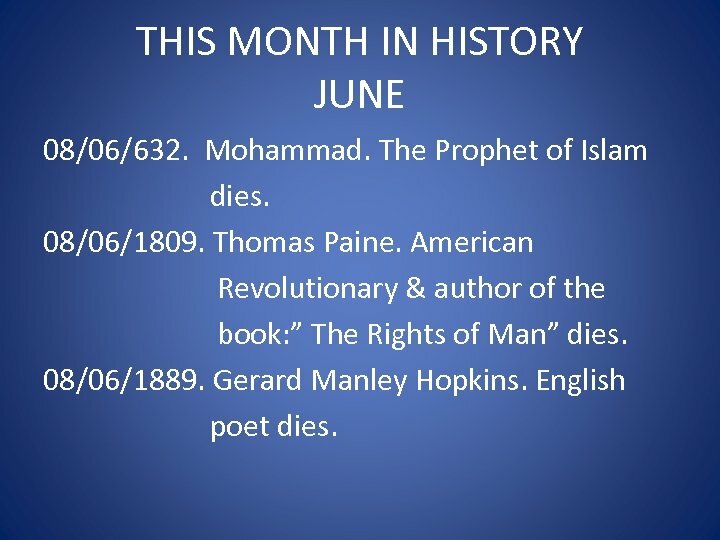 THIS MONTH IN HISTORY JUNE 03/06/1621. Dutch East India company chartered. 03/06/1808. Jefferson Davis. President of the Confederate States of America is born. 03/06/1921. Forbes Carlile. 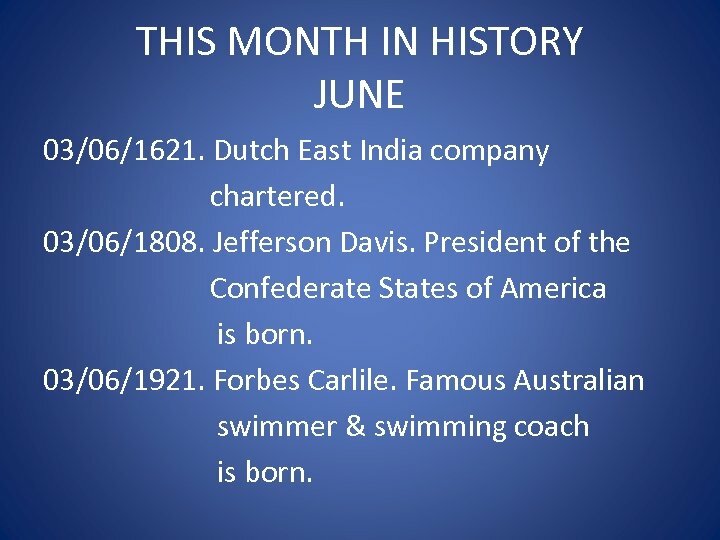 Famous Australian swimmer & swimming coach is born. 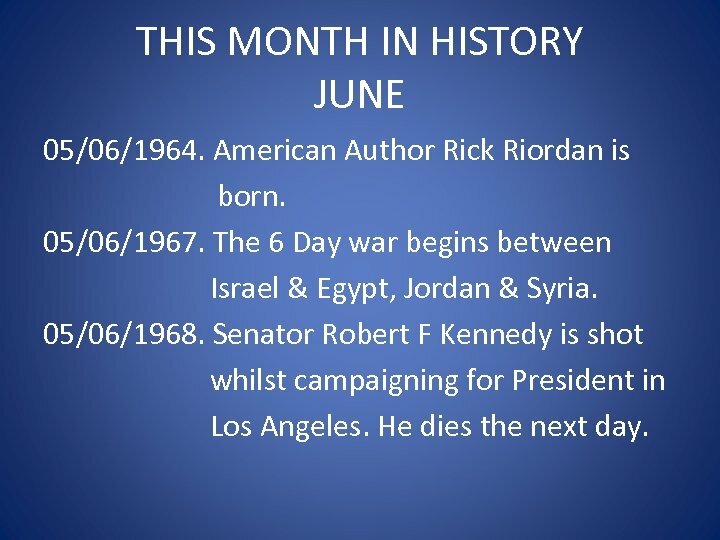 THIS MONTH IN HISTORY JUNE 03/06/1963. Pope John 23 rd. dies. 04/06/1738. King George 3 rd. of England is born. 04/06/1940. 300, 000 British troops are evacuated from Dunkirk in France during W. W. 2. 04/06/1942. The Battle of Midway begins in W. W. 2. 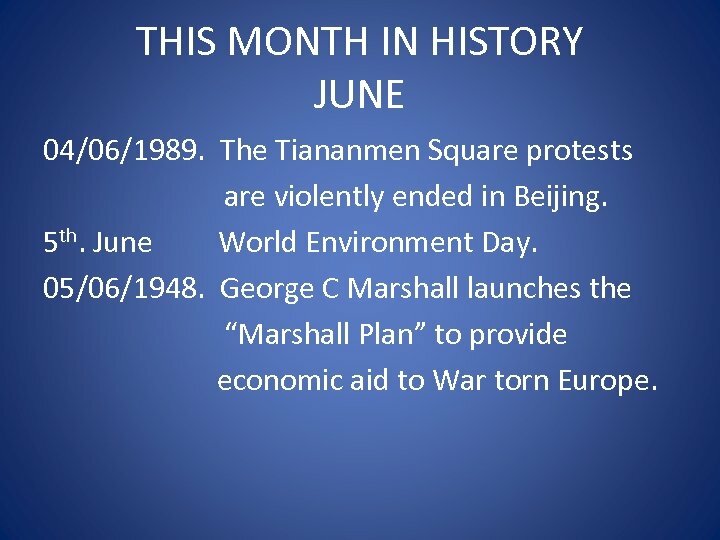 THIS MONTH IN HISTORY JUNE 04/06/1989. The Tiananmen Square protests are violently ended in Beijing. 5 th. June World Environment Day. 05/06/1948. George C Marshall launches the “Marshall Plan” to provide economic aid to War torn Europe. 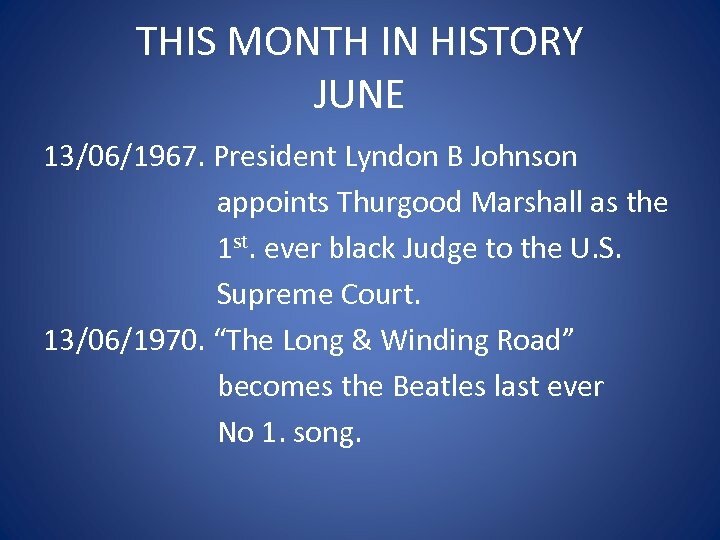 THIS MONTH IN HISTORY JUNE 05/06/1964. American Author Rick Riordan is born. 05/06/1967. The 6 Day war begins between Israel & Egypt, Jordan & Syria. 05/06/1968. Senator Robert F Kennedy is shot whilst campaigning for President in Los Angeles. He dies the next day. THIS MONTH IN HISTORY JUNE 05/06/2004. Ronald Reagan. President of the U. S. A. 1981 -1989 dies. 05/06/2015. Alan Bond. Famous Australian Businessman & America’s Cup Hero dies. 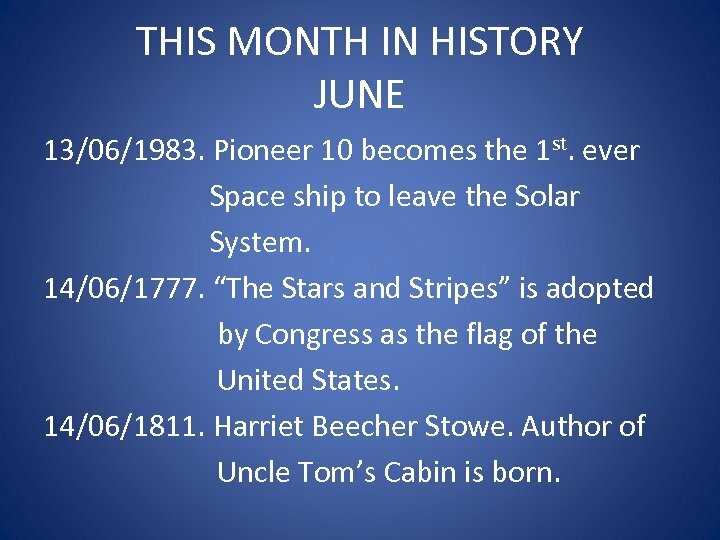 THIS MONTH IN HISTORY JUNE 06/06/1844. The YMCA is founded in London. 06/06/1859. Queensland is established as a separate colony from N. S. W. 06/06/1942. The U. S. Navy defeats the Japanese Navy in the Battle of Midway in W. W. 2. 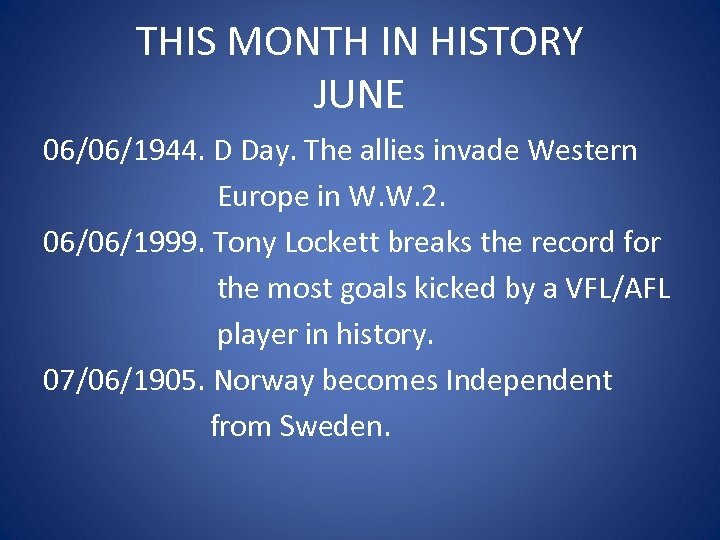 THIS MONTH IN HISTORY JUNE 06/06/1944. D Day. The allies invade Western Europe in W. W. 2. 06/06/1999. Tony Lockett breaks the record for the most goals kicked by a VFL/AFL player in history. 07/06/1905. Norway becomes Independent from Sweden. 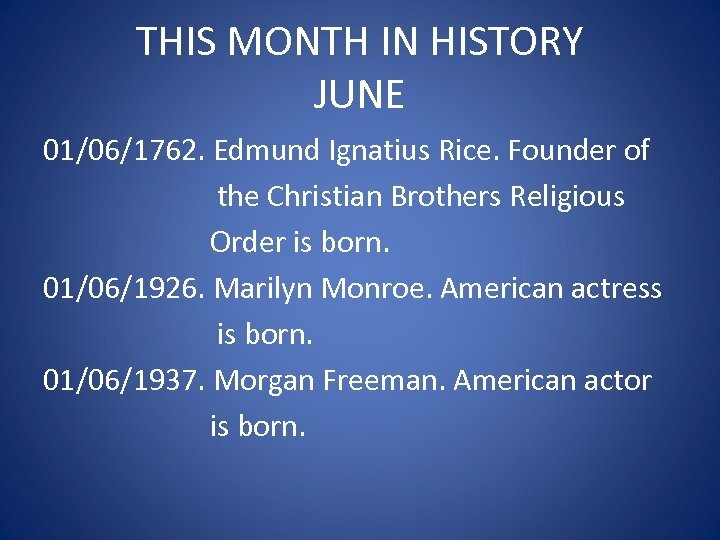 THIS MONTH IN HISTORY JUNE 08/06/632. Mohammad. The Prophet of Islam dies. 08/06/1809. Thomas Paine. American Revolutionary & author of the book: ” The Rights of Man” dies. 08/06/1889. Gerard Manley Hopkins. English poet dies. 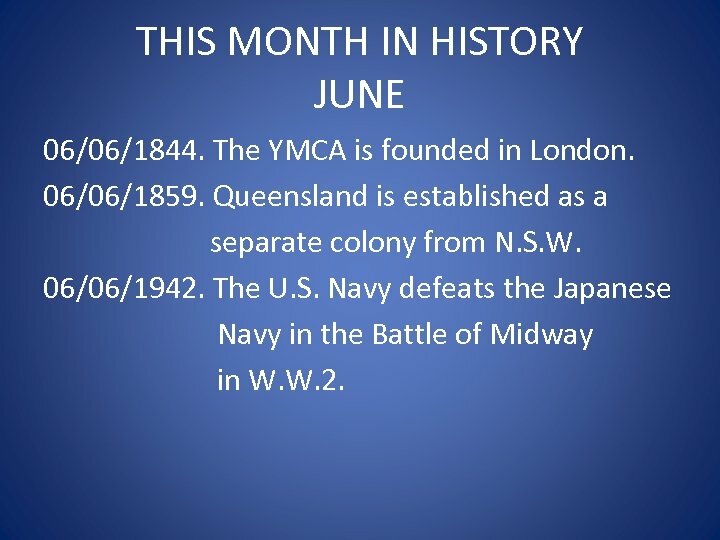 THIS MONTH IN HISTORY JUNE 08/06/1942. Japanese submarines attack Sydney & Newcastle in W. W. 2. 08/06/1968. James Earl Ray is arrested & subsequently convicted for the murder of Dr. Martin Luther King. 08/06/1968. Senator Robert F Kennedy is buried beside his brother J. F. K. at Arlington National Cemetry. 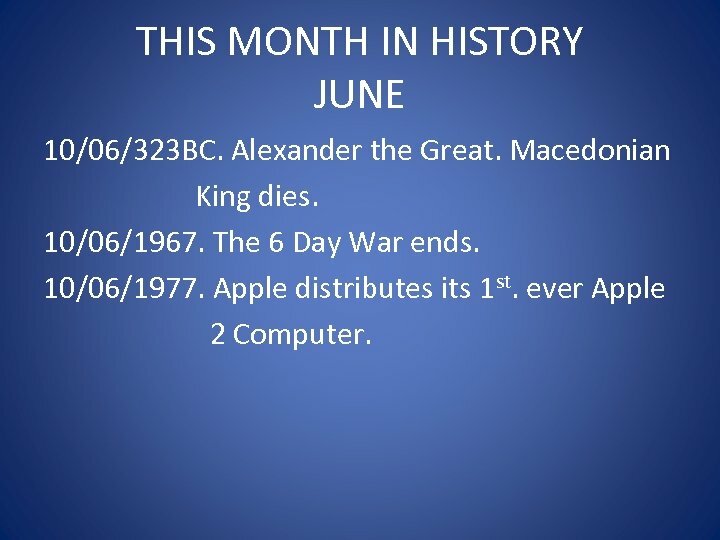 THIS MONTH IN HISTORY JUNE 09/06/68 AD. Roman Emperor Nero commits suicide. 09/06/1672. Peter the Great. Czar of Russia is born. 09/06/1781. George Stephenson. British engineer known as the father of the railways is born. 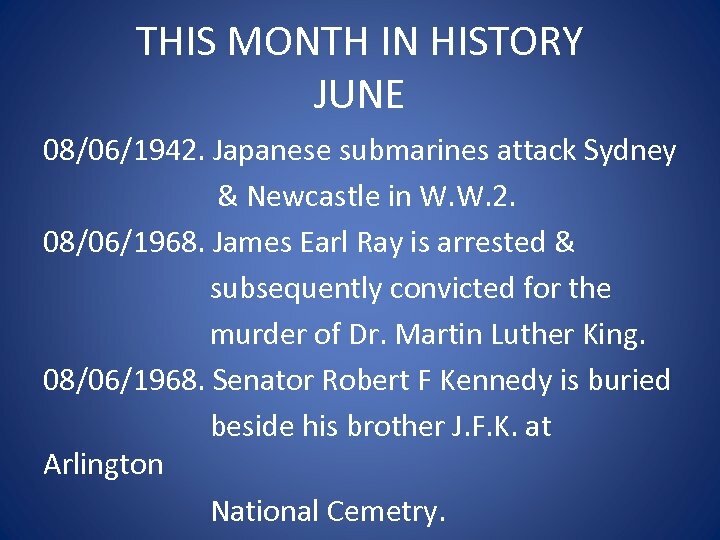 THIS MONTH IN HISTORY JUNE 9/06/1961. Michael J Fox. Canadian born actor is born. 9/06/2017. Adam West – American actor – who played Batman in the T. V. Series Batman & Robin dies. 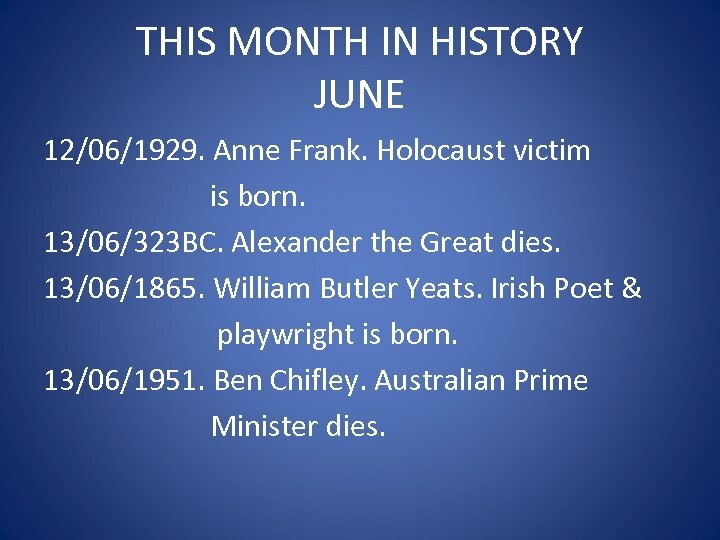 THIS MONTH IN HISTORY JUNE 10/06/323 BC. Alexander the Great. Macedonian King dies. 10/06/1967. The 6 Day War ends. 10/06/1977. Apple distributes its 1 st. ever Apple 2 Computer. 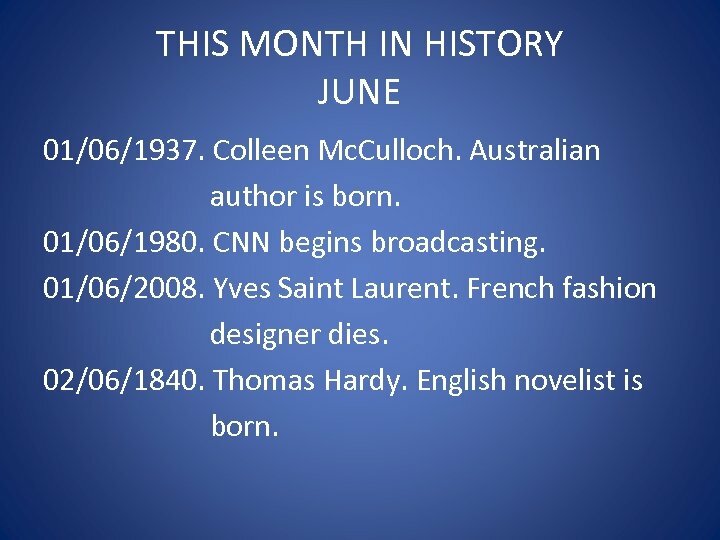 THIS MONTH IN HISTORY JUNE 12/06/1929. Anne Frank. Holocaust victim is born. 13/06/323 BC. Alexander the Great dies. 13/06/1865. William Butler Yeats. Irish Poet & playwright is born. 13/06/1951. Ben Chifley. Australian Prime Minister dies. 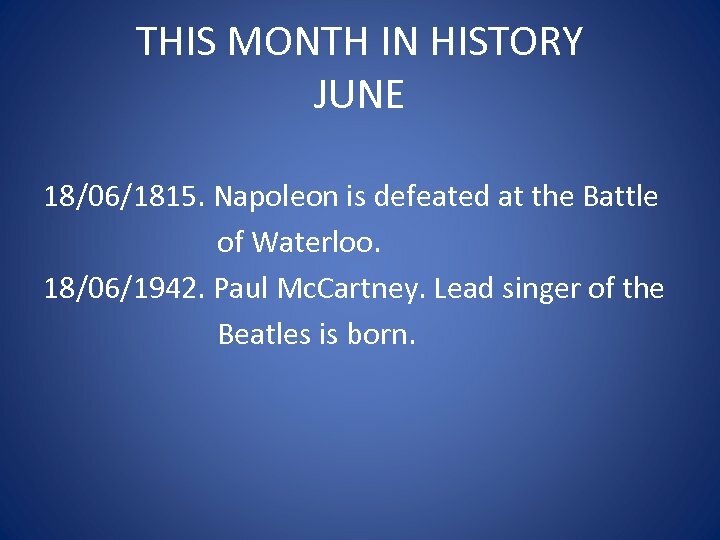 THIS MONTH IN HISTORY JUNE 13/06/1967. President Lyndon B Johnson appoints Thurgood Marshall as the 1 st. ever black Judge to the U. S. Supreme Court. 13/06/1970. “The Long & Winding Road” becomes the Beatles last ever No 1. song. 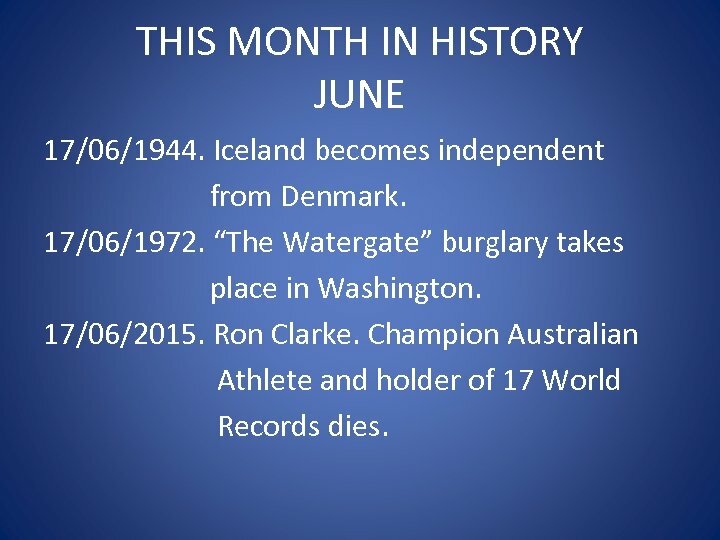 THIS MONTH IN HISTORY JUNE 13/06/1983. Pioneer 10 becomes the 1 st. ever Space ship to leave the Solar System. 14/06/1777. “The Stars and Stripes” is adopted by Congress as the flag of the United States. 14/06/1811. Harriet Beecher Stowe. Author of Uncle Tom’s Cabin is born. 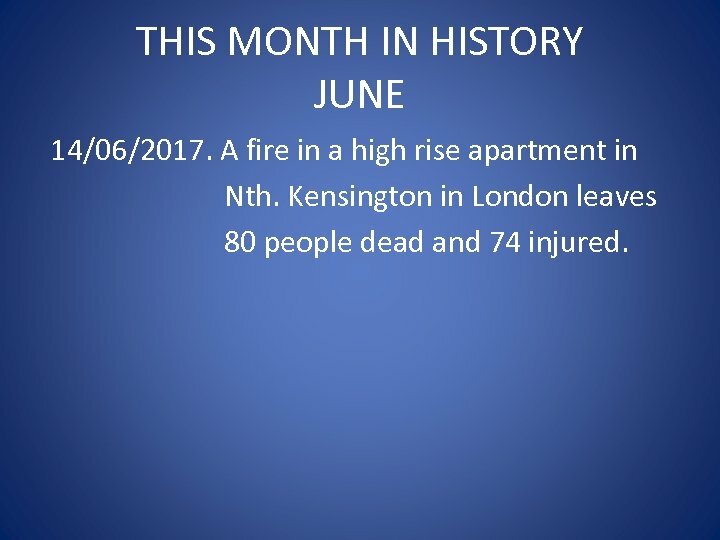 THIS MONTH IN HISTORY JUNE 14/06/2017. A fire in a high rise apartment in Nth. Kensington in London leaves 80 people dead and 74 injured. 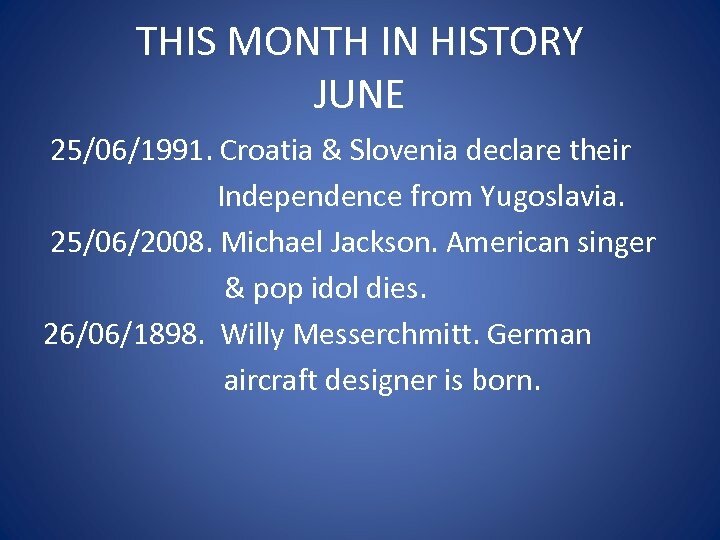 THIS MONTH IN HISTORY JUNE 15/06/1215. King John signs the Magna Carta. 15/06/1843. Edvard Greig. Norwegian composer is born. 15/06/1844. 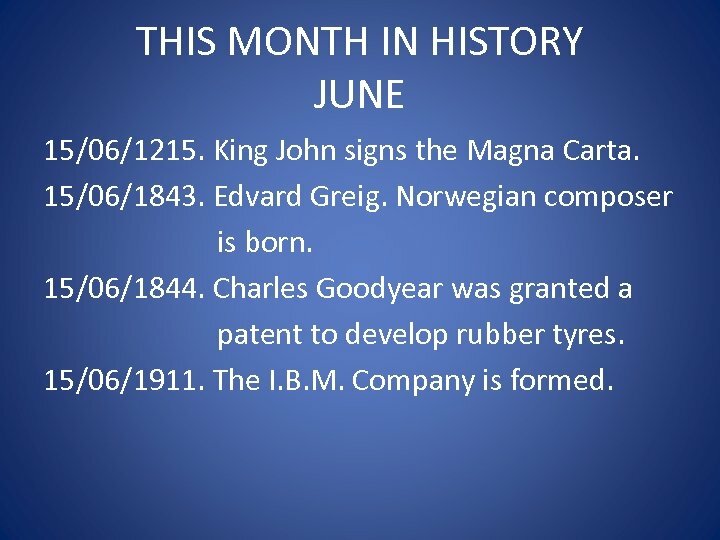 Charles Goodyear was granted a patent to develop rubber tyres. 15/06/1911. The I. B. M. Company is formed. 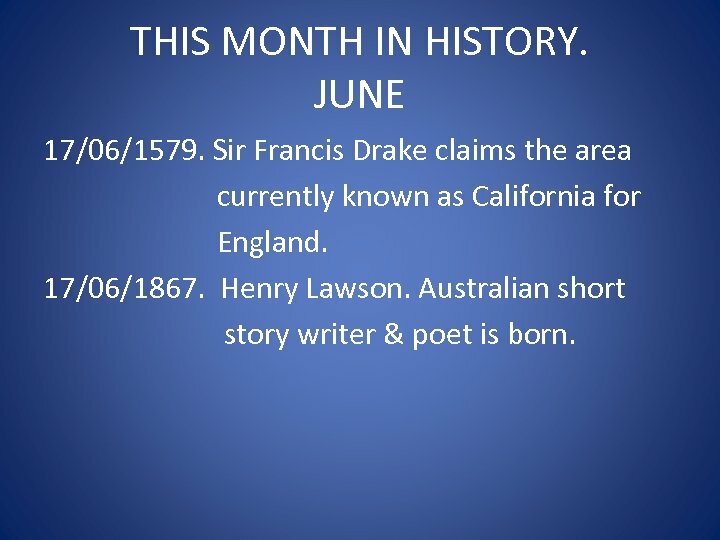 THIS MONTH IN HISTORY JUNE 16/06/1858. President Abraham Lincoln delivers his “House Divided” speech. 16/06/2017. Helmut Kohl – the 6 th. Chancellor of Germany and the man responsible for the reunification of East & West Germany in 1990 dies. 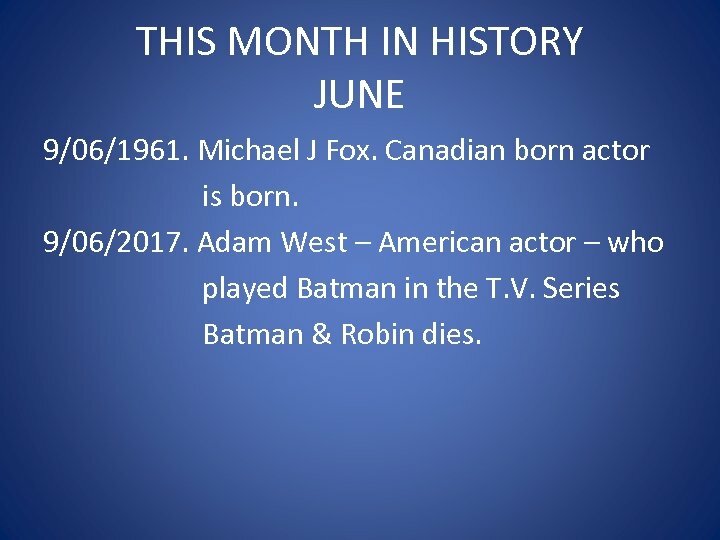 THIS MONTH IN HISTORY. JUNE 17/06/1579. Sir Francis Drake claims the area currently known as California for England. 17/06/1867. Henry Lawson. Australian short story writer & poet is born. 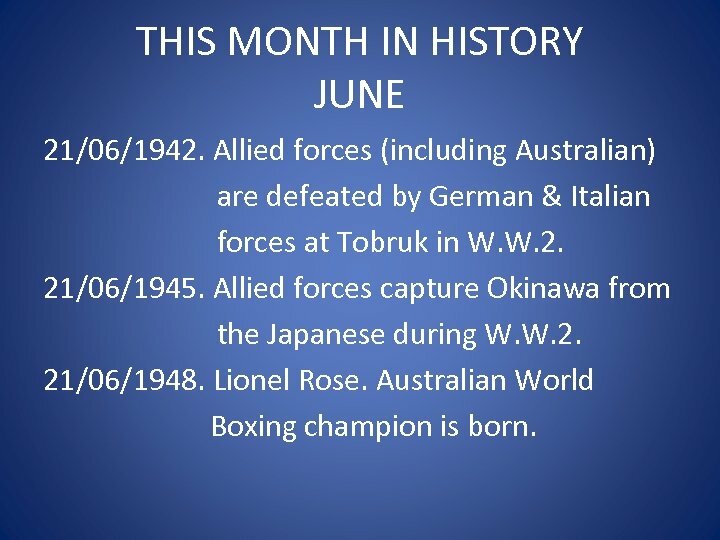 THIS MONTH IN HISTORY JUNE 17/06/1944. Iceland becomes independent from Denmark. 17/06/1972. “The Watergate” burglary takes place in Washington. 17/06/2015. Ron Clarke. Champion Australian Athlete and holder of 17 World Records dies. 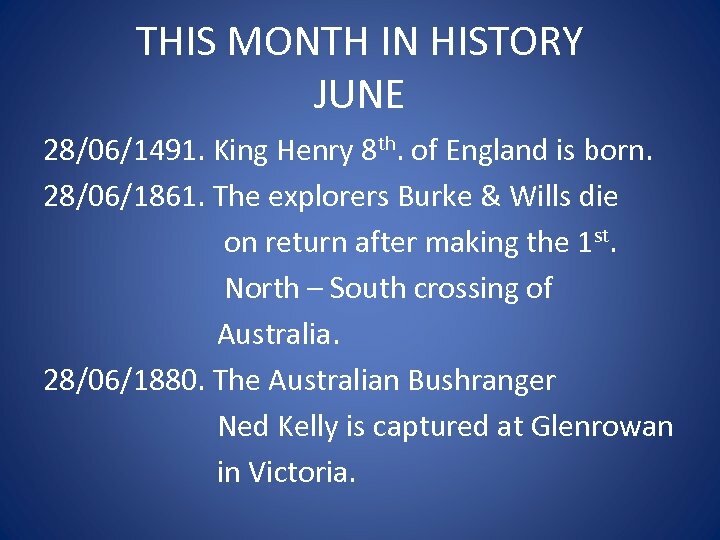 THIS MONTH IN HISTORY JUNE 18/06/1815. Napoleon is defeated at the Battle of Waterloo. 18/06/1942. Paul Mc. Cartney. Lead singer of the Beatles is born. 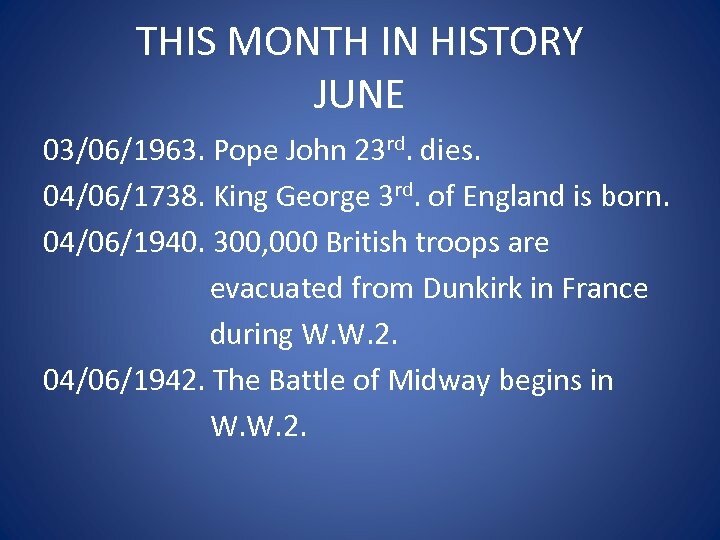 THIS MONTH IN HISTORY JUNE 21/06/1942. Allied forces (including Australian) are defeated by German & Italian forces at Tobruk in W. W. 2. 21/06/1945. Allied forces capture Okinawa from the Japanese during W. W. 2. 21/06/1948. Lionel Rose. Australian World Boxing champion is born. THIS WEEK IN HISTORY. JUNE 21/06/2005. Cardinal Jaime Sin of Manila & prominent leader during the people’s power revolution in the Philippines dies. 22/06/1887. Julian Huxley. British biologist is born. 22/06/1940. France surrenders to Germany in W. W. 2. 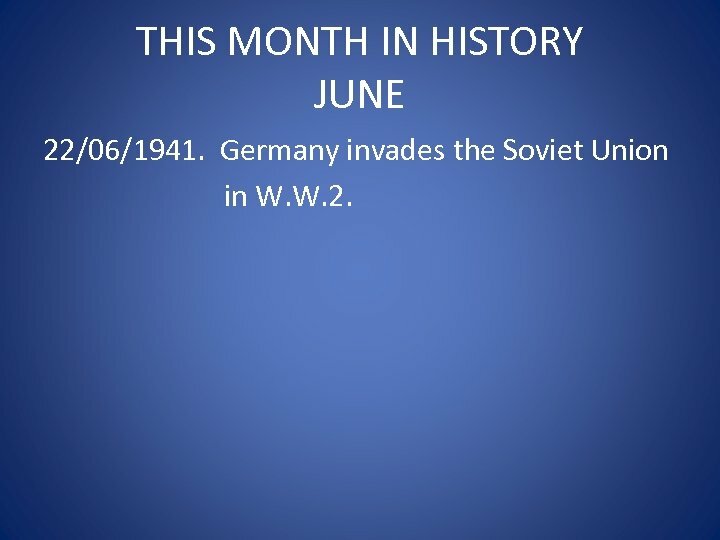 THIS MONTH IN HISTORY JUNE 22/06/1941. Germany invades the Soviet Union in W. W. 2. 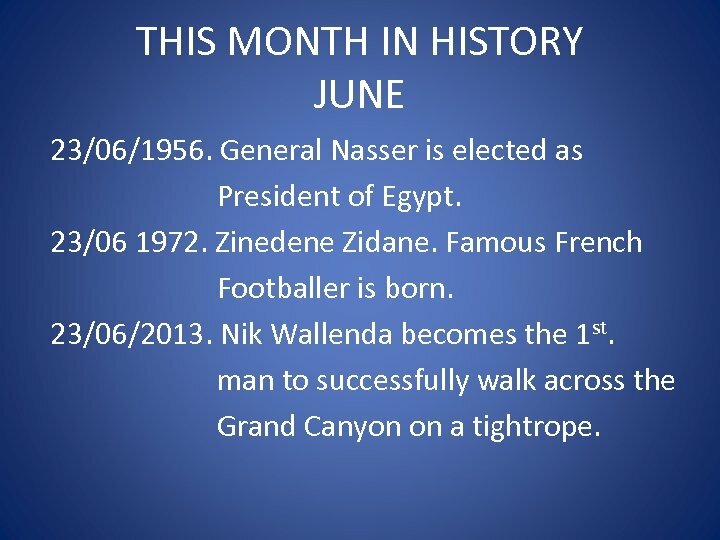 THIS MONTH IN HISTORY JUNE 22/06/2012. 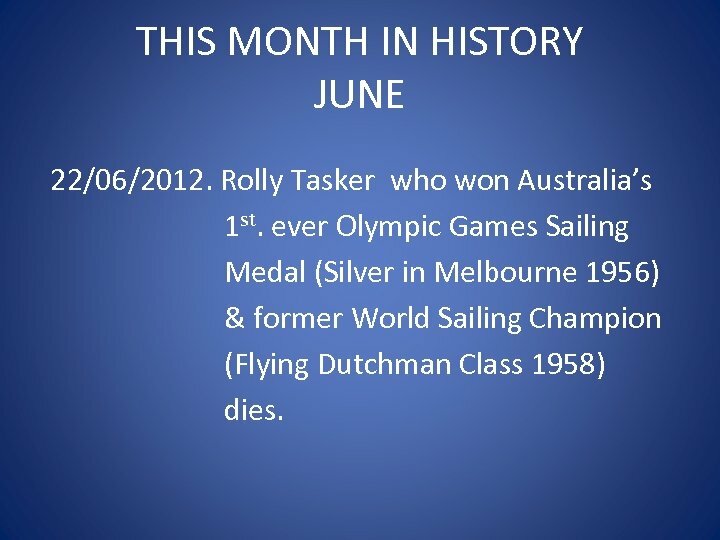 Rolly Tasker who won Australia’s 1 st. ever Olympic Games Sailing Medal (Silver in Melbourne 1956) & former World Sailing Champion (Flying Dutchman Class 1958) dies. 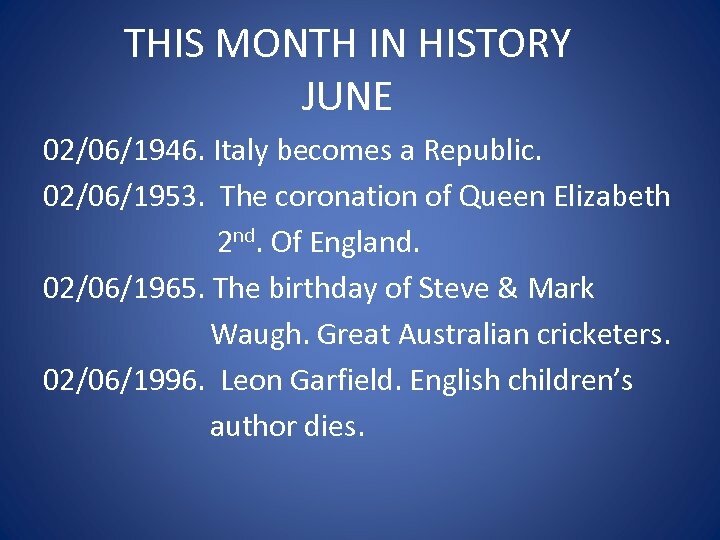 THIS MONTH IN HISTORY JUNE 23/06/1956. General Nasser is elected as President of Egypt. 23/06 1972. Zinedene Zidane. Famous French Footballer is born. 23/06/2013. Nik Wallenda becomes the 1 st. man to successfully walk across the Grand Canyon on a tightrope. 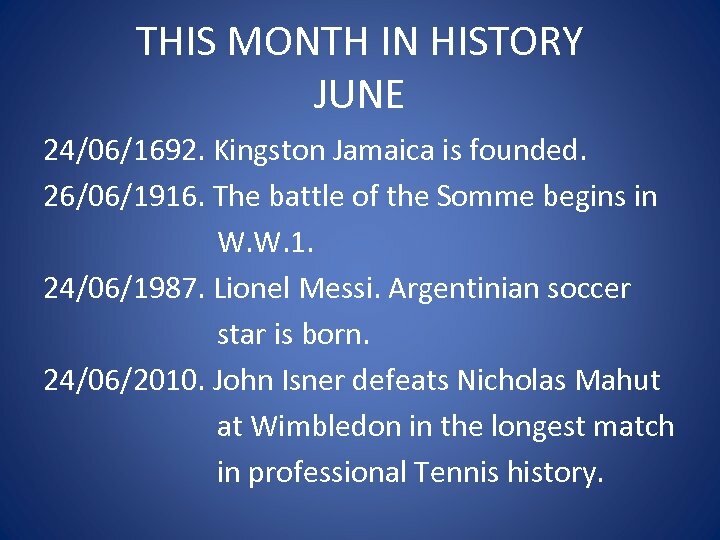 THIS MONTH IN HISTORY JUNE 24/06/1314. The Scots defeated the English at the Battle of Bannockburn. 24/06/1441. King Henry 6 th. opens Eton College. 24/06/1571. Manila is founded as the capital of the Philippines. 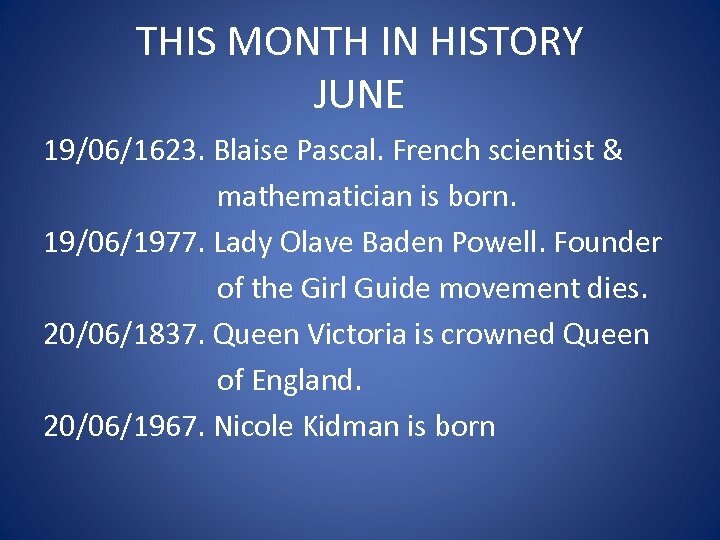 THIS MONTH IN HISTORY JUNE 24/06/1692. Kingston Jamaica is founded. 26/06/1916. The battle of the Somme begins in W. W. 1. 24/06/1987. Lionel Messi. Argentinian soccer star is born. 24/06/2010. John Isner defeats Nicholas Mahut at Wimbledon in the longest match in professional Tennis history. THIS MONTH IN HISTORY JUNE 24/06/2010. Julia Gillard becomes the 1 st. Female Prime Minister of Australia. 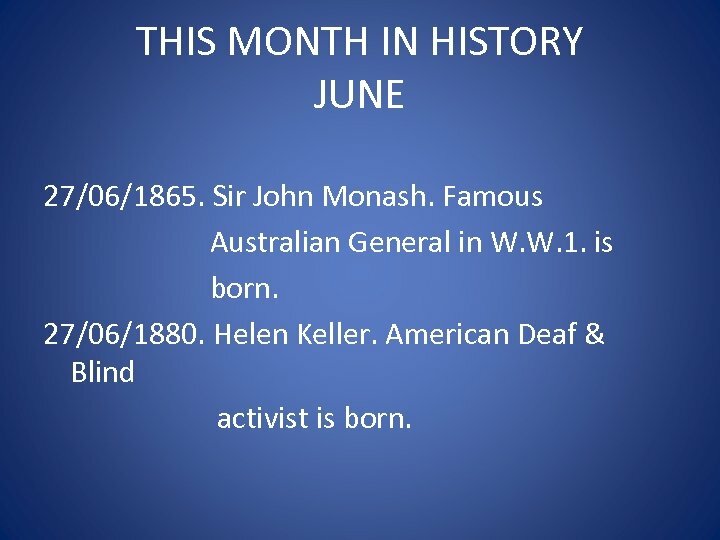 THIS MONTH IN HISTORY JUNE 25/06/1900. Lord Louis Mountbatten. 1 st. Governor General of India is born. 25/06/1903. George Orwell. British author is born. 25/06/1950. The Korean War begins. 25/06/1963. President John F Kennedy utters his famous words: “Ich Bin Ein Berliner” on a visit to Berlin. 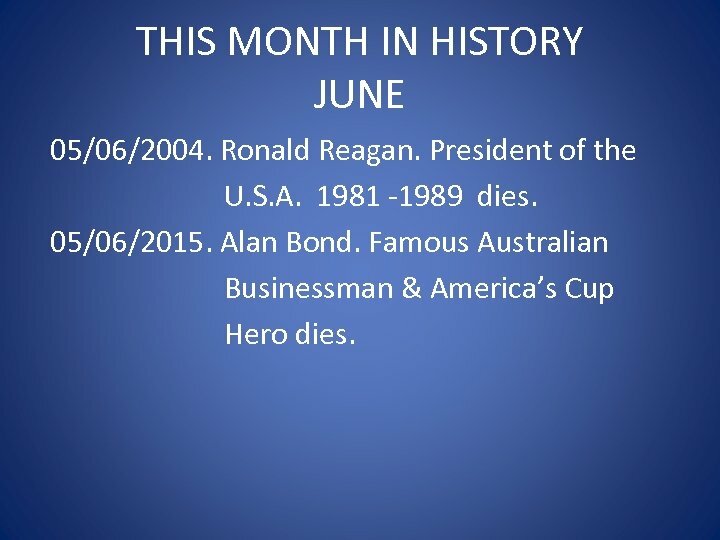 THIS MONTH IN HISTORY JUNE 25/06/1991. Croatia & Slovenia declare their Independence from Yugoslavia. 25/06/2008. Michael Jackson. American singer & pop idol dies. 26/06/1898. Willy Messerchmitt. German aircraft designer is born. 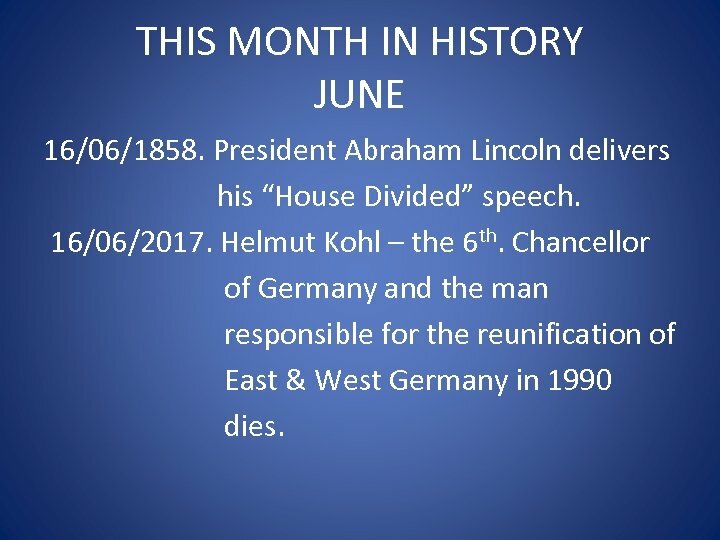 THIS MONTH IN HISTORY JUNE 27/06/1865. Sir John Monash. Famous Australian General in W. W. 1. is born. 27/06/1880. Helen Keller. American Deaf & Blind activist is born. 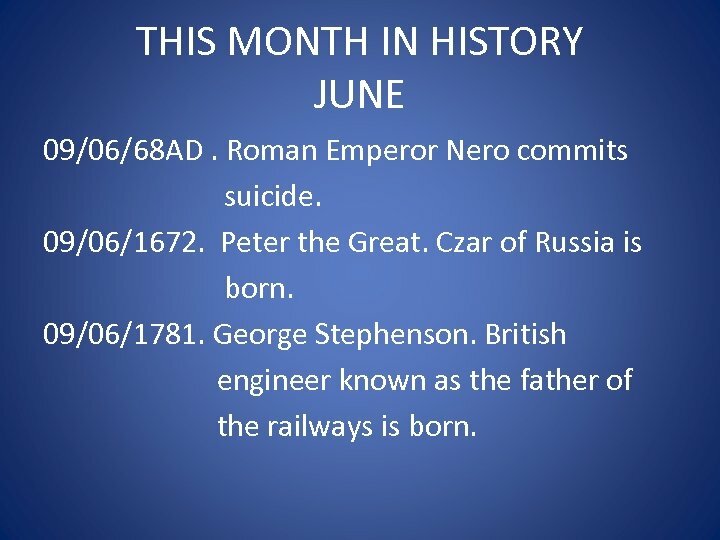 THIS MONTH IN HISTORY JUNE 28/06/1491. King Henry 8 th. of England is born. 28/06/1861. The explorers Burke & Wills die on return after making the 1 st. North – South crossing of Australia. 28/06/1880. The Australian Bushranger Ned Kelly is captured at Glenrowan in Victoria. 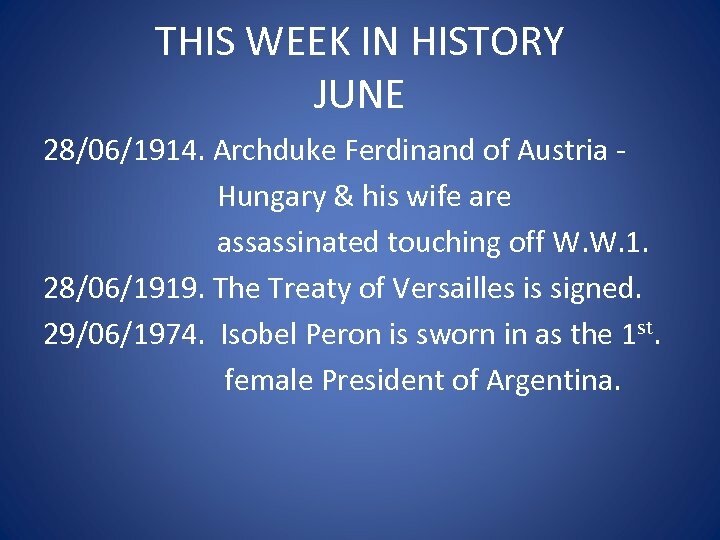 THIS WEEK IN HISTORY JUNE 28/06/1914. Archduke Ferdinand of Austria Hungary & his wife are assassinated touching off W. W. 1. 28/06/1919. The Treaty of Versailles is signed. 29/06/1974. Isobel Peron is sworn in as the 1 st. female President of Argentina. 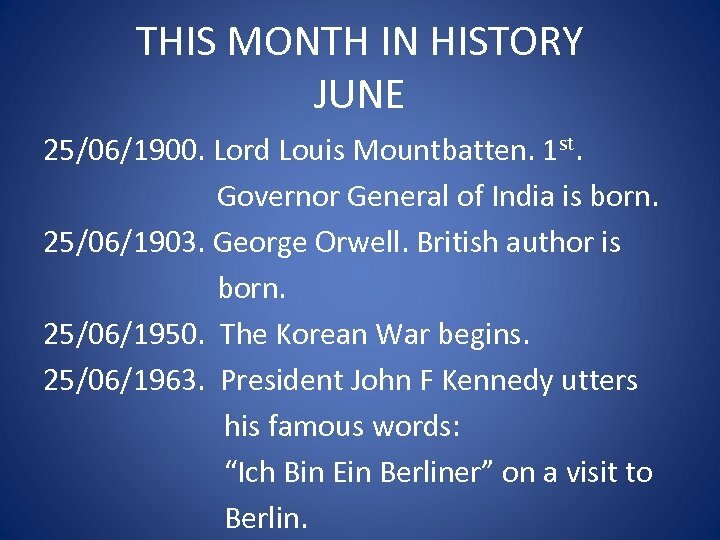 THIS MONTH IN HISTORY JUNE 30/06/1950. U. S. President Harry S Truman orders U. S Ground Forces into action in the Korean War. 30/06/1958. Alaska becomes a U. S. State. 30/06/1960. The Congo becomes independent. 30/06/1997. The United Kingdom hands back Hong Kong to the Republic of China. 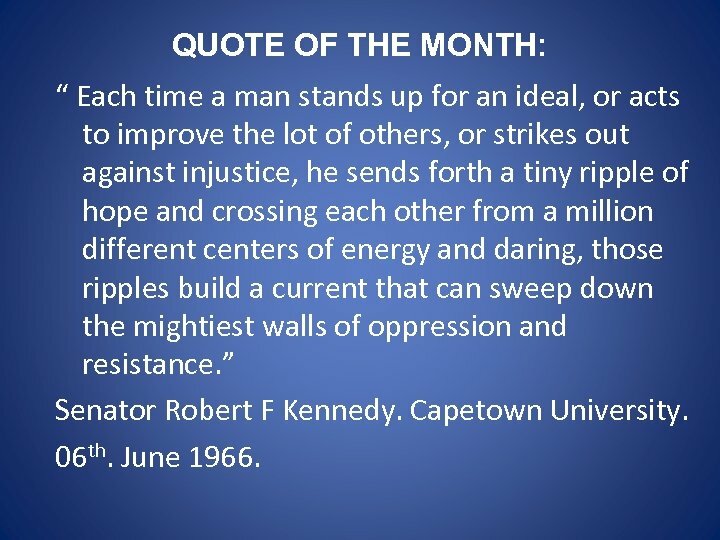 QUOTE OF THE MONTH: “ Each time a man stands up for an ideal, or acts to improve the lot of others, or strikes out against injustice, he sends forth a tiny ripple of hope and crossing each other from a million different centers of energy and daring, those ripples build a current that can sweep down the mightiest walls of oppression and resistance. ” Senator Robert F Kennedy. Capetown University. 06 th. June 1966.